It wasn’t easy bidding adieu to our tranquil lakeside hotel in Traverse City. That morning I sipped a cup of coffee out on the balcony, enjoying the refreshingly cool temperatures. Then my daughter and I took one last walk on the beach in search of seashells. It was a wonderful way to start Day 3. With an open itinerary other than a final destination of Petoskey, Mich., a couple hours north, we decided to follow the backroads, passing through the tiny hamlet of Alden where we paused to let the kids burn off some steam playing tennis and doing their best “American Ninja Warrior” impersonations on the challenging playground. We drove another seven miles north before stopping off at a public access to Torch Lake, one of the clearest freshwater lakes in the country. Then, while Cass and Boogs splashed around in the shallows looking for interesting stones, my son and I made the seven-mile trip back to the playground in Alden to retrieve my wife’s sunglasses, which she had given to our daughter to hold, and which our daughter had set on the ground because they were apparently too heavy to hold even for a few seconds. Sunglasses recovered, we continued northward to the charming town of Bellaire, which despite its diminutive size had one of the biggest and best microbreweries I’d ever visited: Short’s Brewing Company. After sampling a couple local crafts, including a tasty double-IPA called the “Michigantuan,” we again hit the road. Our next brief stop was at Ellsworth, where we took a few moments to climb around on a super-cool jungle-gym contraption made of rope. Over the years we’ve learned that if you want to keep the little ones happy during the long miles on the road, be sure to sprinkle in a couple playground stops along the way. Next we visited the New-England-esque lakeside town of Charlevoix. This charming town not only has a vibrant and eclectic main street but also a scenic lakeshore featuring a marina packed with sailboats and a waterside amphitheater. We had a wonderful time exploring the town for an hour or so before indulging in our third ice cream cone in as many days. Another not-so-secret tip for a successful road trip: don’t skimp on the ice cream. Finally we made our way to our third night’s stay, an upstairs room at Bill and Terrie’s Airbnb, just north of Petoskey. Basically it was just an upper room in their secluded suburban home. But it was quite cozy and a welcome respite from the road. Cass and the kiddos were worn out by the day’s explorations and decided to hunker down for the day. My wanderlust was not yet satisfied, however, so I traveled 10 miles back into downtown Petoskey to explore its distinctive bayside business district. My favorite part was the old train tracks (no longer in use) which still ran through the center of town through — go figure— Pennsylvania Park. Apparently the rails were originally part of the Michigan Northern Railway before being consolidated into the Pennsylvania Railroad, hence the name of the park. Call me crazy (or dorky), but there’s just something charming about old railroad tracks, and any town that has the foresight to let them remain is all right with me. Eventually I made my way back to our room to call it a day and rest before our next day on the much-anticipated Mackinac Island! I have to admit, I wasn’t looking forward to today’s itinerary. 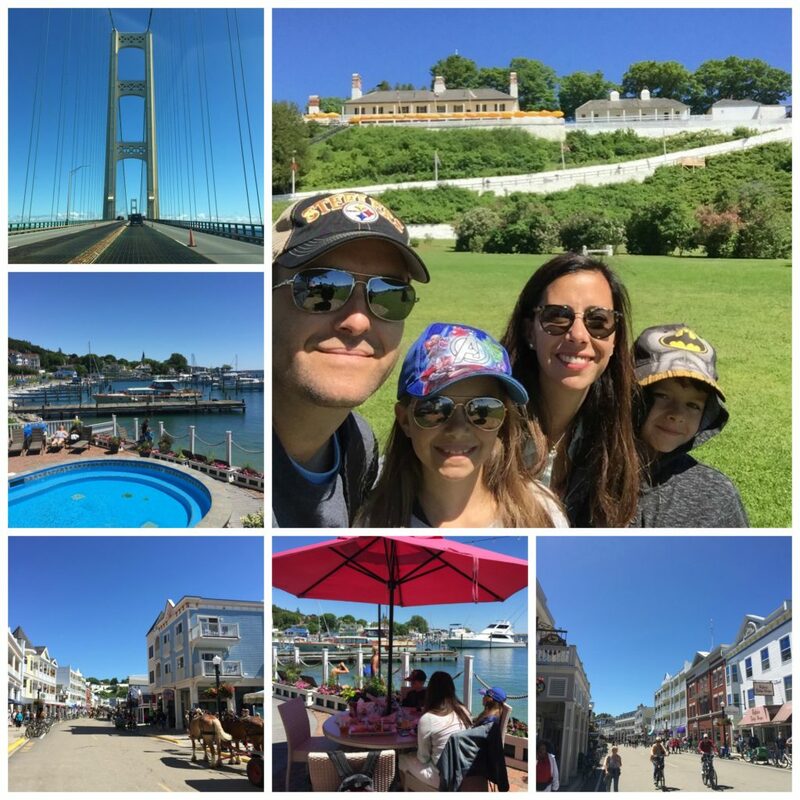 The plan was to take the ferry to Mackinac Island and spend the entire day there. Personally, I prefer to bounce around and explore a bunch of different places each day, so the idea of staying put on some hoity-toity island didn’t sound all that great. Boy, was I wrong. First we drove over the Mackinac Bridge, which certainly doesn’t get enough attention as far as suspension bridges go. Sure, the Golden Gate is impressive, and red, but if you ask me the Mackinac Bridge, with its massive ivory towers and foliage-green trusses, doesn’t get the recognition it deserves. The span stretches for an incredible five miles, and rises to a height of 552 feet to allow for the safe passage of large ships beneath. It’s magnificent. 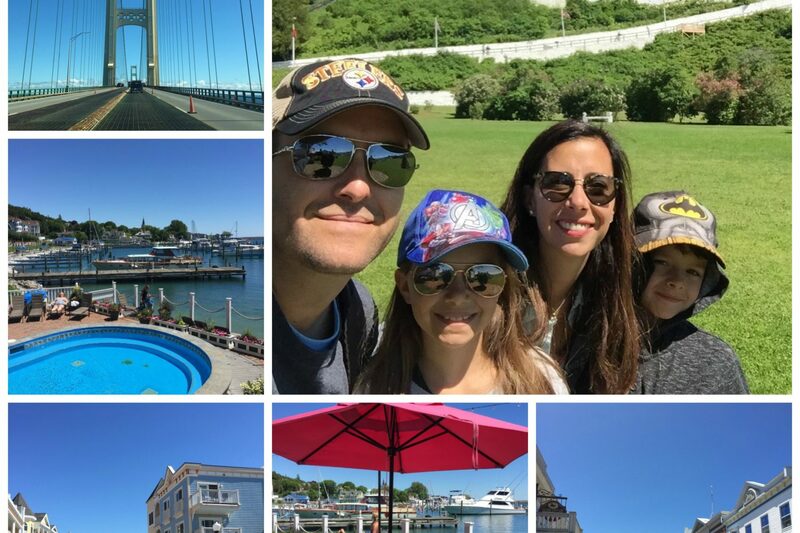 After packing a day bag in the parking lot at St. Ignace, we hopped onto one of Starline’s speedy hydro-jet ferries and headed over to the island in Lake Huron. The entire ride only took 15 minutes or so as we enjoyed the brisk northern Michigan air. Along the way we took in the breathtaking views of the palatial estates overlooking the bluffs, as well as the aptly named Grand Hotel, famous for being the setting for the romanic cult classic — and one of my wife’s all-time favorite movies — “Somewhere in Time” (1980) starring Jane Seymour and the late Christopher Reeve. Mackinac Island is stunning from the moment you come into dock. The attractive and colorful main street features an array of pleasing 19th-century architecture and runs right along the water. High above it all, old Fort Mackinac overlooks the expansive and beautiful Marquette Park. One of the best features about the island is that cars are prohibited. So everywhere you look people are seeing the sights via pedal power or on one of the many horse-and-carriages clip-clopping around town. Our only beef was that the horses weren’t wearing those fancy little horsey diapers, and every once in a while you’d catch a whiff of something unpleasant. But the overall beauty of the island made up for any momentary olfactory unpleasantness. We took a cursory walk around town before renting some bikes of our own to get around a little faster. For $6 per hour, per bike, it was a no-brainer. At one point we left the paved path and pushed our bikes up a wooded trail to the front lawn of the Grand Hotel. Beneath the bright, clear blue sky the hotel looked spectacular. Out in the front lawn the staff was preparing a large barbecue for hotel guests, while off to the side a father and daughter played a game of lawn bowling, aka, bocce. After snooping around the hotel lobby for a bit, it was time to return the bikes. So we headed back to town where, thanks to my Pittsburgh Steelers ball cap, we met a group of folks from Mars, Pa. It really is a small world after all. Next we headed to lunch at the Pink Pony restaurant and managed to get a table right on the water. We couldn’t have asked for a more perfect setting for a meal. I enjoyed some fresh perch soft tacos paired with a Widow Maker Black Ale from Keweenaw Brewing Company in Houghton, Mich., followed by a 51K IPA, courtesy of the Blackrocks Brewery in Marquette. After lunch the kids ended up jumping into the Chippewa Hotel’s oversized hot tub next door, fully clothed like a couple of hoopies. What can I say? High-class we are not. Meanwhile Cass and I enjoyed yet another drink by the water, sincerely hoping the day would never end. But of course it had to. So we caught the 4:30 p.m. ferry back to the mainland and hit the road for our three-plus-hour drive to Marinette, Wisconsin. It was a long haul for sure, but a beautiful one as well, as we traveled 180-plus miles along Routes 2 and 41 in Michigan’s Upper Peninsula, aka, the U.P. With the sky-blue waters of Lake Michigan on our left and the forbidding woods of the U.P. to our right, it felt like we were in Alaska. I wouldn’t have been surprised if a wooly mammoth stepped out of the forest and onto the road. Either that or a sasquatch. Alas, the only creatures we encountered were a life-size statue of an albino Bigfoot and a baby sauropod. We rolled into to Marinette around dusk and settled in for the night. Tomorrow it would be another three-hour drive and then a surprise for the kids: some watery fun at the Wisconsin Dells! 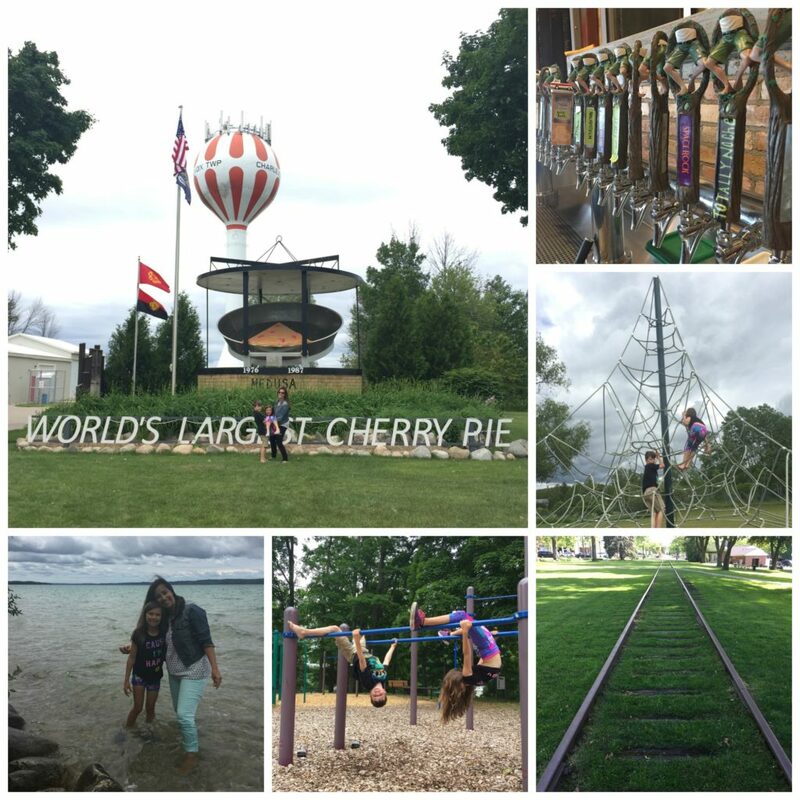 2 Responses to "Road Trip 2017: The Great Midwest, Part 2 — Traverse City to Mackinac Island"
Thanks for posting, great photos and descriptions, brings back years-ago memories of my family, many of whom were from the Petoskey/Traverse City/Torch Lake area. And yes, Torch Lake is just about the clearest lake you’ll ever see. Sounds like a great trip!